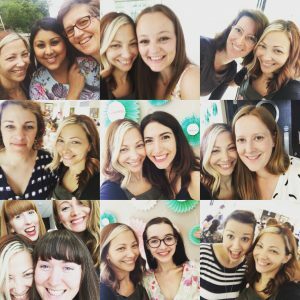 Wow, what a weekend! 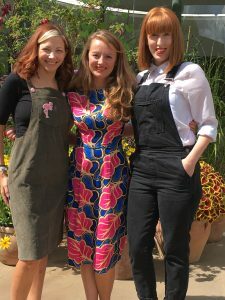 I was definitely in my happy place spending two days in the company of some amazing sewists. 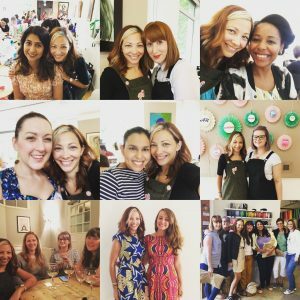 The weekend was a perfect blend of chatting, sewing, workshops, talks and tea! I drove down on the Friday with a couple of lovely local sewists, Jill and Jade. It was a bit of a mammoth drive from the south west but it was made easier with lots of sewing chatter. 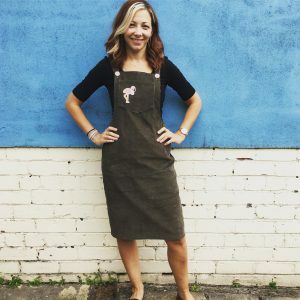 We headed down to Backstitch, which is a gorgeous local fabric shop, just outside of Cambridge town centre. 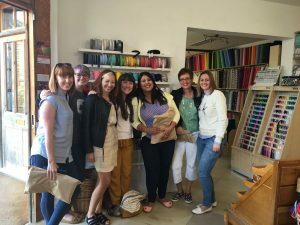 We met up with Rachel, Jodie, Jen, and Elle and had a fab time stroking all of the fabric. 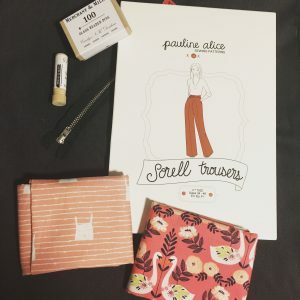 I bought some gorgeous fabric to make some Pauline Alice Sorrell trousers with. 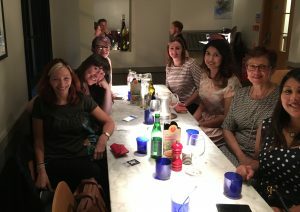 We all met up again for a pizza in the evening, full of excitement for the weekend ahead. 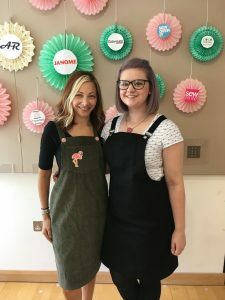 On Saturday morning we headed to the college and were met with a room full of sewing machines and the loveliest people you could hope for, along with some amazingly generous goodie bags!! After the intros, we got on with the business of sewing and getting to know each other. I decided to make a Tilly and the Buttons Cleo as I wanted something easy that I could get done in the time we had. 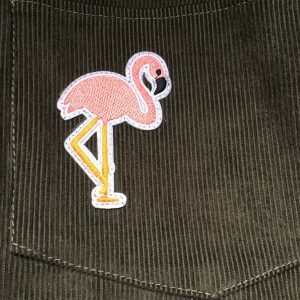 I had bought this lovely olive green fine needlecord from Miss Matabi recently and thought that this little flamingo (who we have named Barry) would sit right at home on the front pocket. 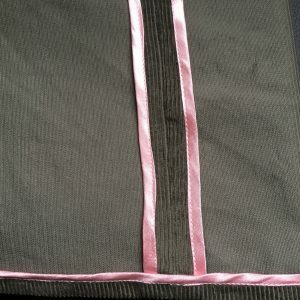 I decided to do Hong Kong bound seams as I wasn’t sure I would have access to an overlocker. Following a morning of sewing, we all headed into the town centre for lunch at possibly the worst time ever! What started out as just a bit of rain, turned into a full-on storm, which we were out in for about twenty minutes! I think a few pairs of shoes have had to be chucked in the bin, after our rain-soaked adventures! After being ID’d at the pub (!) and a quick bite to eat, we headed back and got changed into some warm, dry clothes and settled down to listen to the two afternoon speakers. First up was Portia Laurie from Makery. 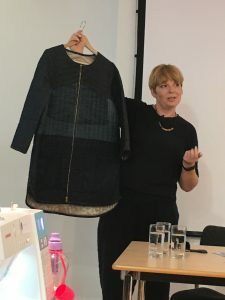 Her talk focused on refashioning clothes and making the most from your wardrobe. 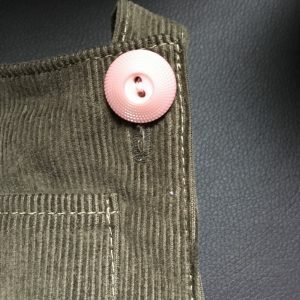 I was really inspired to join in with the refashioners project this year, which is all about up cycling mens suits. Fiona Parker from Diary of a Chainstitcher then talked to us about her fascinating job working to create costumes for stage and screen. 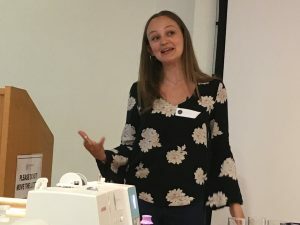 I spent some time with the ever wonderful Elle from Sew Positivity, learning about the new Janome MC500e embroidery machine. 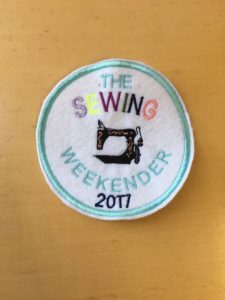 We all got to make our own badges as a memento of the weekend. I then did a hand embroidery workshop with the gorgeous Elisalex from By Hand London. I made a start on a back pocket of a pair of jeans. I didn’t get the chance to finish it, but it’s something I can sit and finish in front of the tv at some stage soon. 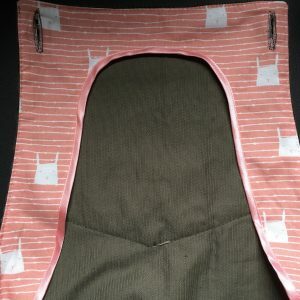 By the end of day one, I had made the majority of my Cleo dungaree dress and just had to hem it and do the buttonholes the next day. I was pretty pleased with my progress considering I had spent the majority of the day chatting! We all descending on a local pub for dinner in the evening. To their credit, they coped with the siege of 50+ sewists admirably and the food was great. 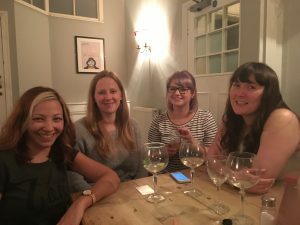 We then spent the rest of the evening in the pub chatting until we got kicked out! Day two started with another couple of talks. 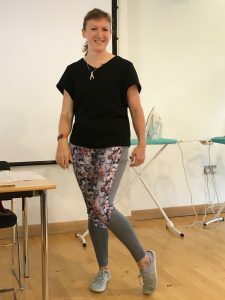 Melissa Fehr from Fehr Trade, gave a really interesting talk about active wear and fitting your clothes according to your needs, environment and lifestyle. I instantly bonded with Melissa over her cat leggings too! 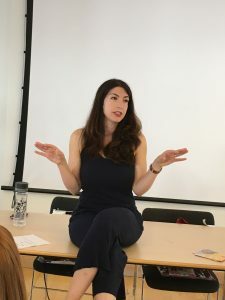 Elena Rosa Brown from Randomly Happy’s talk really resonated with a lot of us. She talked about mindfulness in sewing and being really present and not putting too much pressure on yourself. The key takeaway from Elena’s session was to remember to breathe while you sew! I managed to finish my Cleo off relatively quickly, following some arguing with the machine over the buttonholes! I’m glad I chose a relatively easy pattern as it meant I didn’t have to concentrate too hard and could just enjoy myself and get to know lots of other lovely sewing people more. As the weekend drew to a close there were lots of hugs and promises of meeting up soon and I really do think that some great friendships have been forged and nurtured. I’ve come away from the weekend so inspired and excited. Sewing really is good for the soul.